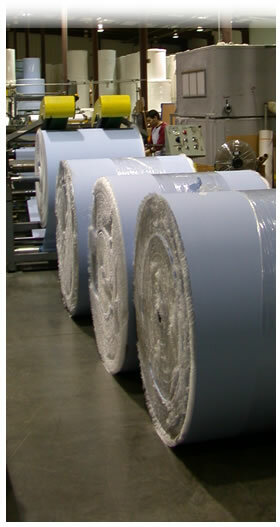 Straubel Paper Company makes roll stock of scrim and DRC for use in manufacturing and paper converting products utilizing nylon reinforced paper (Scrim) and non-woven cellulose wipers (DRC). Scrim is a durable nylon-reinforced paper. Scrim is made by sandwiching a layer of nylon scrim netting between multiple layers of textured paper. An example of an end product would be disposable paper wipers. DRC is a very durable non-woven wiper made from wood pulp, binders and a soft clothlike material that is absorbant. DRC is cellulose-based and is typically used industrially for water, grease, oil and paint clean-ups. Straubel Paper Company is a century old! September 2007 marks Straubel's 100-year anniversary in business.